The top of this handcrafted, Western style coffee table features a recessed, inner, rectangular top covered with a hand hammered, copper panel. 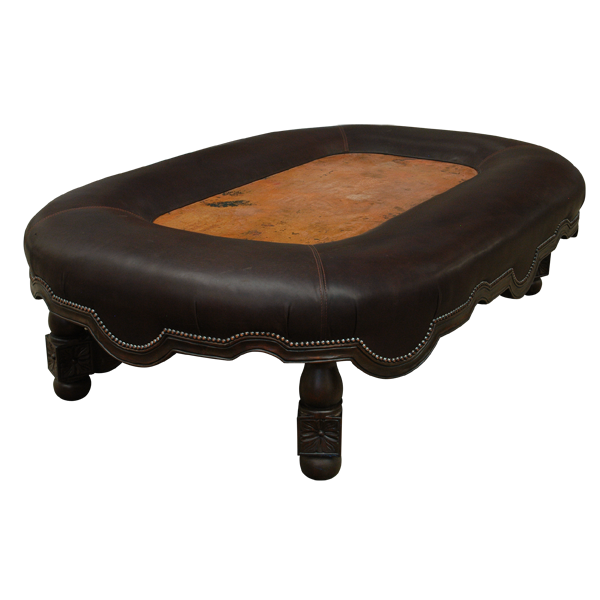 The copper panel is bordered by padded sides, covered with dark, chocolate colored, full grain leather. The leather upholstery extends down the sides of the base of the coffee table to the curved details of the lower base. The leather is hand tacked to the lower base with lovely, gilt nails. Also, the leather is double stitched together for extra strength and durability. The coffee table is supported by elegant, hand turned legs. It made with the best, sustainable, solid wood available, and it is 100% customizable.